Left: Crocus spot lit by winter sun. Right: Crocus in soft light created by using a diffuser. I am often asked what is my favourite lighting. Since no type of light suits all subjects, I don’t favour any particular one. However, soft diffused light gives stunning results for many flowers – especially pastel-toned ones; whereas direct sunlight is good for bold reds and oranges and creating shadows that can add a dynamic element to the composition. There is no better way of appreciating just how effective a diffuser can be at reducing high contrast and strong shadows than by taking comparative shots with and without one. 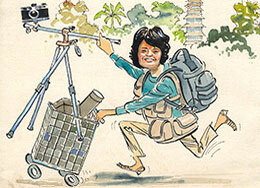 Carrying a diffuser is the equivalent to having your own portable miniature cloud for use on sunny days. The first pair of images feature a crocus. On the left, the flower is spotlit by sun beaming through trees at 4:10pm in March. The result is a dramatically lit flower emerging from its surroundings completely in shadow with no hint of the adjacent plants. 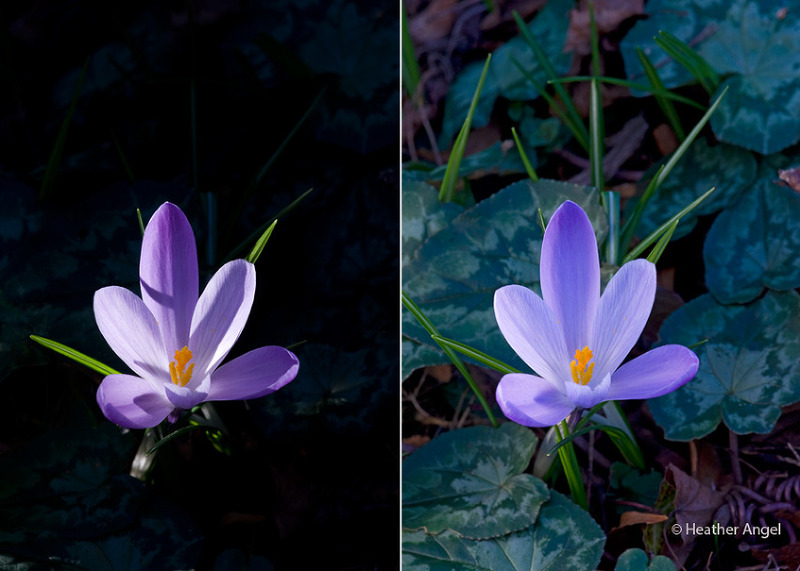 When a large Lastolite Tri-grip diffuser was held between the sun and the crocus, this dramatically reduced the contrast (and the light level by two stops). Whenever a diffuser is used, the light needs to be re-metered with it in position. The exposure for the first shot was 1/30 sec at f/18 and, with a diffuser, I retained the same aperture and changed the shutter speed with an exposure of 1/8 sec at f/18. The second shot is more restful to the eye. It also more informative since it reveals the ground beneath the crocuses is carpeted with attractively patterned cyclamen leaves. 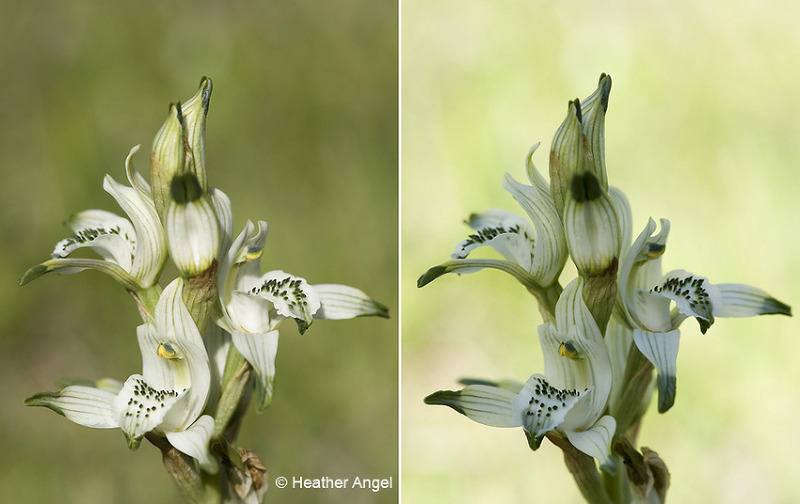 The second pair of images was taken in Chile and shows one of many terrestrial Chloraea orchids, which are typically white and green, with some yellow and green species. This one is Chloraea volkmannii. Growing in a meadow bathed in sunlight, the left shot is as found with the sun shining directly on the orchid and the grass behind. By using a small diffuser to block out the sun falling on the orchid only and not on the background, resulted in an enhanced tonal variation of light reflected from the two. The background appears brighter because I had to re-meter the flower and adjust the exposure. This can be a useful way of separating a subject which has a similar colour and tone from the background – notably grasses against green vegetation. The aperture was kept constant for both shots at f/11. In sunlight the ISO was 160 and the exposure 1/400 at f/11. With a diffuser used for the right-hand shot, I pushed the ISO up to 400 and the exposure was then 1/250 at f/11. 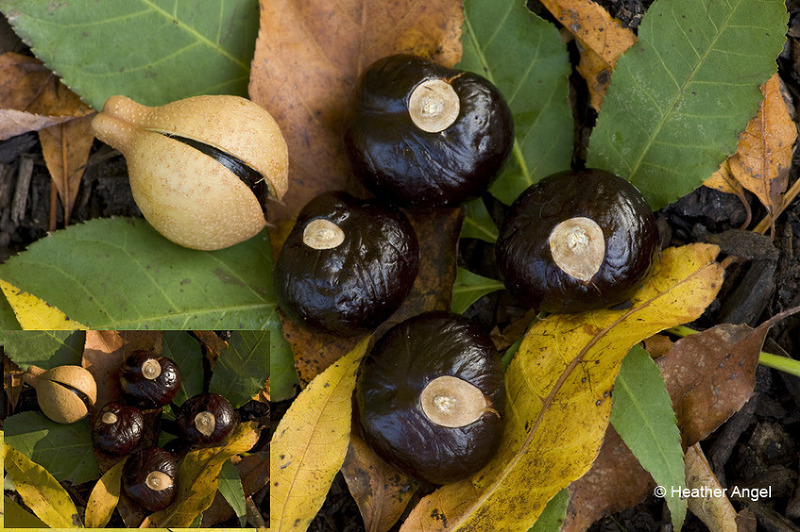 Unlike the chestnut coloured conkers produced by the European horse chestnut (Aesculus hippocastanum), those of Indian horse chestnut (A. indica) conkers are dark brown. They were discovered lit by strong sunlight, when the texture within the deep tones were lost by the conspicuous catchlights from the sun. So a diffuser was used to even out the light and eliminate the harsh shadows. These three comparative pairs show how dramatically diffused light can change the appearance and mood of a close-up subject. By experimenting, you will soon appreciate that some subjects work fine when lit with direct light, while others are enhanced by diffused light.